In this 2013 file photo, a student at Belmont-Cragin Early Childhood Center posts his name tag. About 60 percent of students at the center and the affiliated Belmont-Cragin Elementary are English learners — one of the highest percentages in CPS. Aug. 27, 2015, Editors Note: This story received so many comments that violated Catalyst’s comment policy that we have disabled further comments and deleted hundreds of comments that were already posted. A month ago CPS announced it would audit services for English-language learners at every school in the city. Now, officials say, the review will begin in the fall at schools with the highest number of English learners and then work down the line. At 123 schools, at least a third of students are working to become proficient in English. At 545 schools, there is at least one student, according to data from last year. Officials are hoping to complete the task by mid-February but might return to schools in the spring if problems persist. The district’s goal is for all schools, including charters, to meet state- and federally-mandated requirements for providing services to students learning English — an issue that has plagued the district for decades. “Our plan is to establish a firm baseline and work toward better supporting schools,” says Karen Garibay-Mulatierri, who heads the CPS Office of Language and Cultural Education (OLCE). Compliance officers will interview staff, check records and review instructional materials, and then provide principals with a list of what needs to be improved, as well as options for additional teacher training. Already, officials have audited the UNO Charter School Network and found several compliance issues, including a lack of teachers who hold the special credentials for teaching English learners. Based on visits to 22 district-run and charter schools, the state found that CPS as a whole had fully implemented only about a quarter of the 45 state-mandated components of English-learner services applicable to the district. Problems included students exiting bilingual programs too soon, inconsistent screening for services and lack of native language and English as a Second Language (ESL) supports and instructional materials. CPS submitted plans to fix those issues earlier this summer, but the state is still considering the plan and has yet to release the document. But some educators say it’s unfair to hold district-run schools accountable when many are having trouble paying for adequate staffing levels after losing enrollment — and the dollars that follow those students. That CPS is willing to embark on a comprehensive audit of English-learner services represents a renewed focus on an “issue that’s been around for decades,” according to Ricardo Meza, who worked as Chicago’s regional counsel for the Mexican American Legal Defense and Educational Fund at a time when CPS was under a federal consent decree to better serve students of color and English learners. A federal judge lifted that decree in 2009 — a change some say paved the way for reduced staffing in the language and culture office, fewer compliance visits to schools and a subsequent lack of accountability for the district’s growing number of English learners. Today there are 66,000 students working to learn English — the majority speak Spanish as their first language. “This has been a continual problem, and unfortunately the people who are the recipients [of English-learner services] aren’t always in the best position to advocate for themselves, because a lot of them are just struggling to survive, dealing with financial, immigration and societal issues,” says Meza, who went on to become the state’s inspector general and now works in private practice. Back in 1980, the United States Department of Justice (DOJ) sued CPS, alleging the district had segregated black and Hispanic students. As a result of the lawsuit, CPS entered into a consent decree and began putting a desegregation plan in place two years later. The consent decree was modified twice — in 2004 and 2006 — in large part to compel CPS to better serve English learners. In a 2009 trial to decide whether to lift the decree, the DOJ argued that while the district had made strides in racial integration, it “vigorously opposed dismissal of all the ELL provisions” of the decree. In court documents, the DOJ alleged CPS had failed to provide bilingual education services to eligible students in dozens of schools, failed to place students in programs in a timely manner and failed to provide classrooms and libraries with adequate materials for English learners. Even so, a few months later, a federal judge lifted the decree, saying CPS had fulfilled much of its original charge. After that, educators say, the Office of Language and Cultural Education became understaffed and accountability slipped. Under former CEO Jean-Claude Brizard, a 2011 reorganization of OLCE resulted in the firing of many staffers, including managers and bilingual coaches who worked out of the then-equivalent of network offices. The following year, a new OLCE leader shifted the work of compliance officers — who had regularly visited schools — to professional development and drafting documents to guide schools on compliance issues. Garibay-Mulatierri, who came on board in May 2014, says that over the years, there’s been an increasing awareness of best practices in English-language learner education, along with legal standards. But the recent state audit shows some of the same problems persist in some schools: lack of adequate materials and programs that provide support in students’ native language or use ESL techniques. Though CPS compliance officers made visits to charter schools in the past, a new law signed last June clarified that they must be held to the same standards as district-run schools. That means charters must provide native-language supports for bilingual education classes of 20 or more students who speak the same language, and ESL help for smaller groups. The services have to be provided by teachers who hold special credentials to work with English learners — a requirement many charters are working to comply with by sending their staff to take needed coursework. OLCE is devoting some resources to help charters. The office is hiring a full-time staffer dedicated to charter school compliance. That person will assist with consultations, professional development and problem-solving at schools, Garibay-Mulatierri says. And in January, the district began helping to pay for some charter school teachers to get the special teaching credentials through a cohort program at Northeastern Illinois University — a benefit previously offered only to teachers at district-run schools. CPS also is modifying the way it distributes the bulk of money earmarked for English learners to district-run schools. 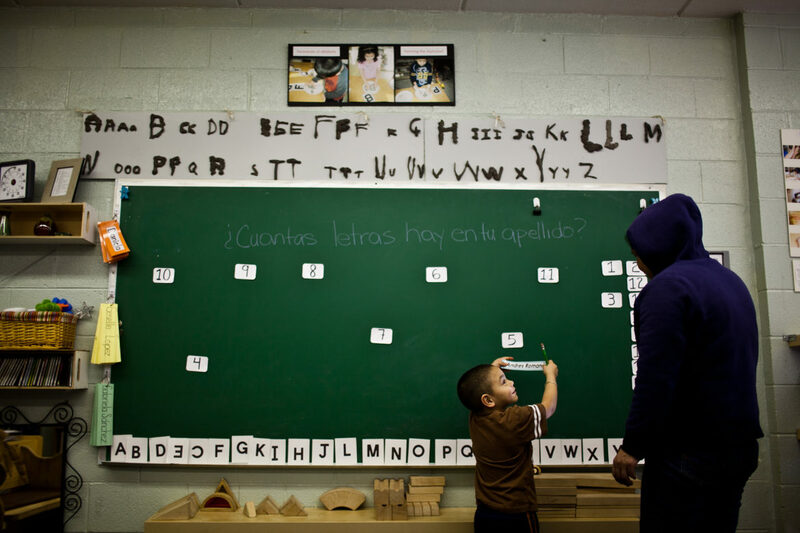 In recent years, CPS based a school’s allocation for bilingual teaching positions largely on the number of English learners enrolled at a school, but then adjusted that number to reflect the amount of time devoted to each child’s special language needs. In addition, some funds were distributed on a per-pupil basis. In the upcoming school year, CPS will base the allocation of teaching positions solely on the number of English learners enrolled. Broadly speaking, Garibay-Mulatierri says, CPS is trying to simplify the way it distributes money to make it easier for district-run schools with lower numbers of English learners to get at least a half-time teaching position for bilingual education. In the past, most schools needed to enroll at least 45 English learners who shared a native language to qualify for a half-time bilingual teaching position. As a result, Garibay-Mulatierri says, some schools got no support for teaching. Under the new formula, a school needs only 20 English learners speaking the same native language to get some teaching support. Schools with the highest number of English learners will receive 1.5 teaching positions paid for by CPS. Garibay-Mulatierri says 89 schools fall into this category for the upcoming school year. Principal Ted Johnson at Albany Park’s Volta Elementary, where more than half of students are English learners, says he prefers CPS to fund bilingual education through teaching positions instead of on a per-pupil basis because experienced bilingual teachers cost more money. Language in the CPS budget book for the upcoming school year echoes officials’ expectations that all schools will provide mandated services. Catalyst reporter Melissa Sanchez contributed to this story.